Jet Inlay Band Rings by Native American Navajo Silversmith Wilbert Muskett Jr. Mr. Muskett offers a traditional style Band Ring with raised channel inlay each individually hand made. These beautiful time honored Jet Inlay Band Rings are great fashion statements as well as replacement Wedding Band Rings, Anniversary Gifts, Commitment Rings or just signs of affection. 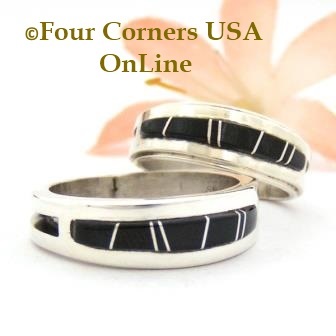 Native American Black Jet Inlay Band Rings are a wonderful alternative to traditional or socially expectant Wedding Rings and a true expression of your personal style. Jet is a natural organic black material that takes a high polish and is preferred by Navajo Silversmiths for inlay designs as it has less tendancy to fracture.